Who would of thought that one of the people I would be helping would have a home based business, literally. Pattie McDonald and her husband, a retired postmaster, rent their beautiful home for vacations nestled in the Ozark Mountains in Missouri. 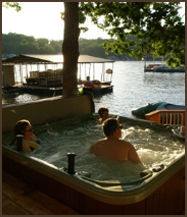 http://www.lakeozarksvacationrental.com/. Per Pattie, the vast majority of her new business comes from those who find her vacation rental in various online vacation directories, many of which come from those who live in neighboring Illinois. Directories are just one of many internet marketing tools that can be utilized as an inexpensive marketing tool for a home based business.